Dianna Agron (born 30 April 1986 in Savannah, Georgia), is an American actress. She stars in the movies The Hunters, I Am Number Four, and The Family, and is known for her role as Quinn Fabray on TV series Glee. 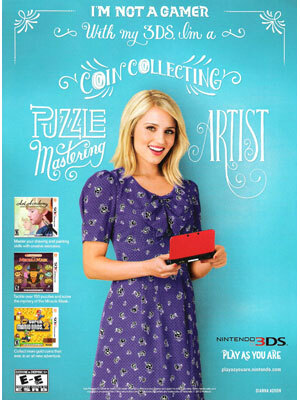 Dianna Agron is featured in the OP Back to College ad campaign with Glee co-star Cory Monteith, 90210's Trevor Donovan, and Gossip Girl's Jessica Szohr (2010), and Nintendo 3DS games (2012). Check out Dianna Agron's Magazine Covers.